The thing to do if you’re fit, have luscious hair, and perfect complexion. Yoga is for everybody and, perhaps more importantly, especially for people who aren’t perfect. Which is all of us, even the gumbo-esque circus performers we see on Instagram. Whether you’ve been practicing yoga for 25 years, only practice it from yoga videos, or have never stepped foot on the mat before, we all have that idea of what yoga looks like it the Western world. It’s the beautiful blonde in her high pony and designer leggings, expensive mat slung over one arm and a fresh pressed juice in the other hand. Fancy leggings and fresh pressed juice are great, don’t get me wrong. Heck, I’ve got tons of fancy leggings and have had more fresh pressed juice than I think my taste buds can handle. But the main issue with this picture is that it limits our idea of what someone who does yoga looks like. There really isn’t one mat, one sports bra, or one type of water bottle that you need before you take up yoga. It’s an intimidating stereotype to try to emulate and it can hide what the true essence of yoga is. And that essence is peace and understanding. The Westernized idea of perfection really has no place in your yoga practice. The idea of perfection is quite frankly the antithesis of yoga, where you should learn to be flexible in all things, including your judgements. 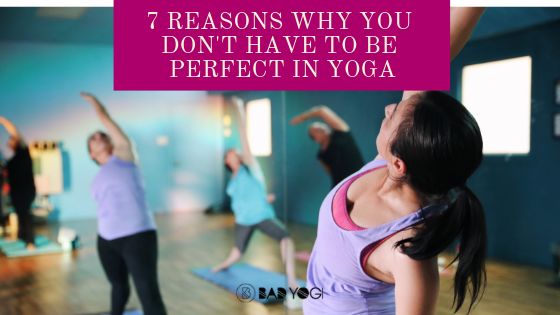 Here are the 7 reasons that prove that, in yoga, “perfect” needs to be left in the parking lot outside of the studio. Have you ever noticed that there are hundreds of variants in yoga, hundreds of ways to go deeper or pull back depending on your need and skill level? That’s because yoga is about the journey and there really isn’t a final destination. Yoga in its entirety is made up of eight areas, called the Eight Limbs of Yoga. Asana, the sanskrit word for ‘posture’, is only one limb of yoga. We call yoga a practice because it’s something we must return to over and over again, both on and off the yoga mat. Yoga is the teacher whose lesson never ends, so you need not worry about getting an A. You get the A for attendance in yoga! An all raw vegan diet is great, but you can still do yoga if your tummy hangs over your pants. You can be a runner, a couch potato, or a pregnant mama and your body is still perfect for yoga. There is no right or wrong way to have a body, no injury or disability that would prevent you from showing up to the mat or the class. You don’t need to wait until you’ve hit your goal weight to be able to do yoga. In fact, you should throw the whole idea of a goal weight out of the window. And yoga will help you to do just that! The more you practice, the more that you will get to know your body and the beautiful, complex system that it is. And the more in love with your body you will become as a result. With a continued practice, you’ll realize that your curves and edges were beautiful all along. That’s right, no one is going to be taking pictures of you struggling to get your head between your knees. The brand of leggings you wear is a non-issue when it comes to a true yoga practice. (…because do you need fancy yoga pants to walk the Eightfold Path? Probably just comfy shoes and an open heart.) You are even allowed to sweat and struggle, maybe grunt a little, and you’re most definitely allowed to fall out of a posture. You are not in a yoga class to look cute or even be looked at at all. You are there for the practice. Yoga should be a practice you come to in order to feel more peace. More peace in your body, more peace with your body, more peace with your fellow (wo)man. Release the need to fit into the yoga girl mold, it’s an outdated and unhelpful trope. Come to class in whatever feels good, no one can stop you. This is a big one! I can’t tell you how many people I’ve heard say that they can’t do yoga because they aren’t flexible… Um, what? That’s exactly why you should do yoga. The practice of yoga will help you to loosen up, send oxygen to your muscles, and relax into postures you once thought impossible. That’s the reason that there are so many challenging postures, because yoga will make you more and more and more flexible. There is always an option to go deeper and to continue the journey (or pull back if you need to). The more you practice, the more you’ll find flexibility in your body, your mind, and your life. If you can’t touch your toes, go to yoga. If you can touch your toes, go to yoga! Guess what, you’re not even competing with yourself. Yup, you heard me right. Ditch the idea that you have to do chaturanga dandasana every sun salutation because the buff 40-something year old woman next to you is doing it. Ditch the idea that you have to hold tree pose for 10 minutes today because you held it for 9 minutes yesterday. The entire practice of yoga, including the other seven limbs of yoga, is all about doing the practice even when it’s hard. Especially when it’s hard. Learning how to find peace with yourself and the present moment is the entire point of yoga. So stop trying to compete and just show up as you are. This is yoga. Yoga will help you to live fully in the moment and that includes accepting what your body can and can’t do depending on the day, time, and place. Don’t become too attached to certain outcomes of your practice, like being flexible or being able to do certain poses. That is not the point of yoga, anyway. Yoga is all about connecting with yourself and universal consciousness. Nowhere in Patanjali’s Yoga Sutras does it say that yoga is meant to push you through to the most difficult poses possible. There are no black belts in yoga. You do not move through the poses in this way. In fact, of the 196 sutras in the Yoga Sutras, asana (or posture) is only mentioned on its own once. So cut yourself some slack and let go of the outcomes you came into your practice with. You are not the same person you were yesterday or last class, so don’t pretend that your yoga is either. I saved this for last because it is the most important thing to remember. Yoga is a means to find peace, not only on the mat but in your entire life. It was created out of a need to bring peace to the people, so let your yoga practice do what it was intended to do. If the practice, style, or teacher of yoga that you are working under doesn’t help to facilitate peace in your mind it is ok to move on. Yoga is here to help connect us with universal consciousness so that we can know true peace. Now that I have my yoga practice I know my body better than ever before and I love it unconditionally. My body and I have a kinder, more understanding relationship. I listen when it tells me to relax and I applaud it when it pushes me to reach beyond my preconceived limitations. My mind and I have a more beautiful understanding, too. We speak a language that is kind and knowledgeable. Perfect is a concept I threw out a long time ago; it has no place in my life. And it definitely has nothing to do with yoga. And if you do one thing today I hope that you can bring Love to the forefront. This article was originally published by Badyogi.com. Read the original article here.